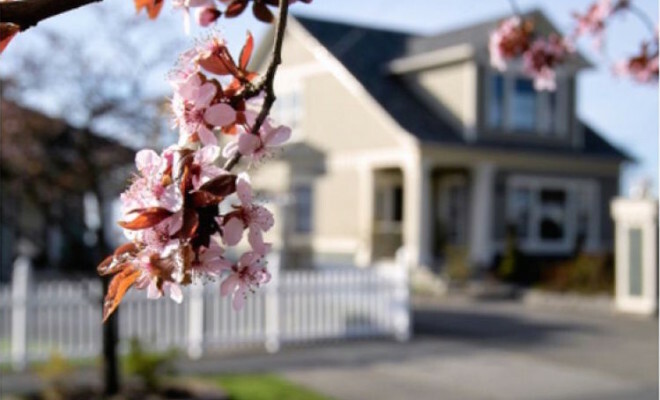 Spring is the hottest time of year for home sales. The holidays are over and good weather is upon us. So now is the time a seller needs to starts applying upgrades to their home in order to put it on the market. When we think of home upgrades people automatically think of the ones that need to be made inside the house. Our minds go right to the basics of painting wall colors neutral, replacing old knobs and drawer pulls on cabinets, getting rid of clutter and making the home appealing for a would-be-buyer. But stop for a minute and think, what is the first thing potential buyers will see? It’s not the wall color or dated vinyl floors. Did you know that people will make assumptions on a home just by driving by? If the outside is unflattering, dated and needs repairs they may drive right by without even stopping to look at the inside. The outside can even bring down the value of a home. Contrary to popular belief, you don’t have to spend a lot of time or money to make the outside of your home look as good as the inside. Not sure where to start? The experts at RubberMulch and RE/Max of New Jersey have teamed up to share their best tips on updating your home’s exterior this spring whether it’s to get it ready to sell or just to make it look more appealing. House Numbers—a super easy and affordable update is to replace house numbers. Today’s house numbers come in a wide variety of styles. Think chic, modern looking styles or utilize your DIY skills to make a rustic type that are attached to wood and hung on your home. Front Door—if your front door is in good condition but needs an update, skip purchasing a brand new door by applying a new coat of paint. With a good coat of primer and a couple coats of exterior paint, your door will look new and striking at first glance. Research shows that a home’s value can increase as much as $8,000 just by updating the front door. Take a look online for some of the more trendy door colors such as canary yellow, kelly green and shiny black. Exterior House Cleaning—realtors suggest a good, thorough cleaning of the front of your home can increase the value from $10,000-$15,000.If you stand back and look at the front of your home do you see mold, mildew, dirt and grunge? Pick up an exterior home cleaner or make your own recipes along with a brush to scrub the dollars back into your home. Mailbox—wobbly, dented and outdated mailboxes are an eyesore and unattractive to potential homebuyers. Replacing it will add more curb appeal to your home but will give it a little personality as well. Gutters—since plugged gutters shout “poor home maintenance,” clean out the leaves and weeds and make any necessary repairs. Plugged gutters can also lead to long term problems with the home and many buyers are warned to look for this problem and avoid a home that hasn’t had gutter upkeep. Windows and Trim—replace broken glass, scrape and paint trim and clean the inside and outside of windows until they shine. Brackets and decorative moldings can really make your exterior pop and are easy to install. Add a couple of window boxes to offer a cottage-like, homey appeal. Roof and Chimney—one of the last things a home buyer wants to see is a roof and chimney that needs work. This is an investment and deters many buyers from a home. It may cost you a bit to repair now but if you don’t, it will come off the bottom line of your home value. So make the repairs now for a better sale. Light Fixtures—strategically placed exterior lighting goes a long way. Exterior lighting is an easy and cost-effective way to add beauty and security to your home. It also highlights your beautiful landscaping and all the upgrades you’ve made to your home. It will also enhance photos a realtor takes of your home when putting it on the market. Think about uplighting to the landscaping and walkway, a hanging pendant light to the front doorway and additional lighting hung near the garage. Find styles that complement your home. Landscaping—this is the time to make an investment in some perennials, trees and bushes for your home if you haven’t already. Most plants you find at your local big box store or local nursery are typically easy to care for and right for your state. Finish off your garden beds with a nice border and quality mulch or rock. You’ll be amazed at how a little work on landscaping goes a long, long way. Rubber Mulch is the original and environmentally responsible mulch made from 100% recycled rubber used in gardens, playgrounds and sustainable landscaping. Rubber Mulch is weather resistant, durable, and the most cost effective mulch around and is specifically designed to protect children from falls on the playground.